In 1995, Knights of Columbus Council 10567 instituted the Colombo Service Award to honor a St. Patrick parishioner for a lifetime of service to Church, Diocese and Community. The Knights felt it was important to recognize those who had contributed many years of service to the parish in a variety of ministries. Often these dedicated servants are the heart and soul of a parish, frequently serving quietly in many areas unknown to others. The award is named in honor of the late Lou Colombo , longtime St. Patrick parishioner and charter member of Knights of Columbus Council 10567. Mr. Colombo, deceased Music Director of St. Patrick Catholic Church, was instrumental in the formation of the Council, working with founder and charter Grand Knight, Louis N. Muro, to recruit members from the parish. The inscription on the award reads: "For Outstanding and Dedicated Service to St. Patrick Catholic Church, the Catholic Diocese of Birmingham, and the Community." The first winner of the award, Catherine Barrett, was originally a member of St. Catherine Church, one of the four churches that merged to form St. Patrick Church. Miss Barrett has been Sacristan for many years and has served the parish and diocese in many roles. The second honoree, Benny Bakane, was one of the most respected and loved Knights in the history of the Council. Benny's spirit, love of the Lord and selfless volunteerism inspired those around him and helped earn him the Colombo award in 1996. Since that time, many other deserving recipients have been honored. 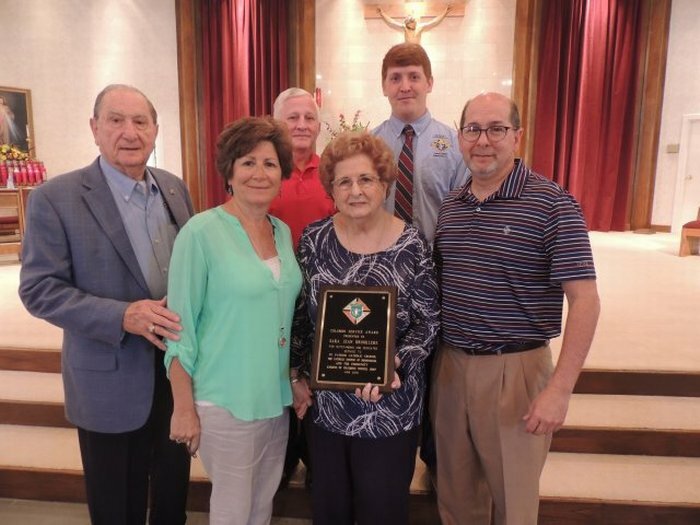 The most recent honoree was Sara Jean Brooklere, a longtime servant of St. Patrick, the Catholic Diocese of Birmingham and the 78 West Community. Sara Jean has spent her entire life serving her family, her church and her community. But her legacy is her unconditional love and friendship for all. The oldest of three, Sara Jean graduated from John Carroll High School when she was just 16-years-old and went to work for the United States District Debtors Court. She went to St. Mark’s and John Carroll with her high school sweetheart, Anthony, and they were married on June 4, 1958. They celebrated their 60th wedding anniversary this year. Wow. She raised two wonderful and accomplished children, Anna and Johnny, but Sara Jean says her heart belongs to her grandsons, Zachary and Caleb. Sara Jean has served St. Patrick for more than 35 years now. Father Pat Sullivan called her and told her the church was planning a Springfest to raise money and to bring the parishioners together. He asked Sara Jean to be in charge of the food with her great friend Alice Slatsky. She said yes and I wonder how many hundreds of people have enjoyed Sara Jean’s meatballs over the years? She won two contests at St. Patrick: a chili cook-off and a spaghetti and meat balls cook-off. She has written a cookbook that has sold over 500 copies. At St. Mark’s she served as President of the Altar Sodality and she has served our Ladies Auxiliary as Treasurer. She has been actively involved in every aspect of St. Patrick life: Springfest, providing food at wake services and funerals, and as Eucharistic Minister. You will often find Sara Jean at the ministry sign-in book ensuring that we have ministers for all aspects of Mass on Sunday morning. Her involvement in the community is even more impressive. A charter member of the 78 West Business and Professional Women’s Association, Past President of both the Jefferson County Pharmacy Ladies Auxiliary and State of Alabama Auxiliary. She is a charter member and Past President of the Forestdale Lion’s Club Ladies Auxiliary. Sara Jean is proud of her Italian heritage and she is an active member of the Italian American Heritage Society. When her daughter Anna took charge of the Society’s St. Joseph altar, Sara Jean was right there with her, working her magic to help make it a success. An astute businesswoman, Sara Jean still does the payroll for Adamsville Pharmacy and as a buyer. There is a saying that “Behind every great man there is a great woman.” And the accomplishments of Anthony Brooklere are well documented. But Sara Jean Brooklere need stand behind no one in terms of her legacy as a servant to her family, her church, her community and to her friends. Below is a list of all recipients of the Colombo Service Award.